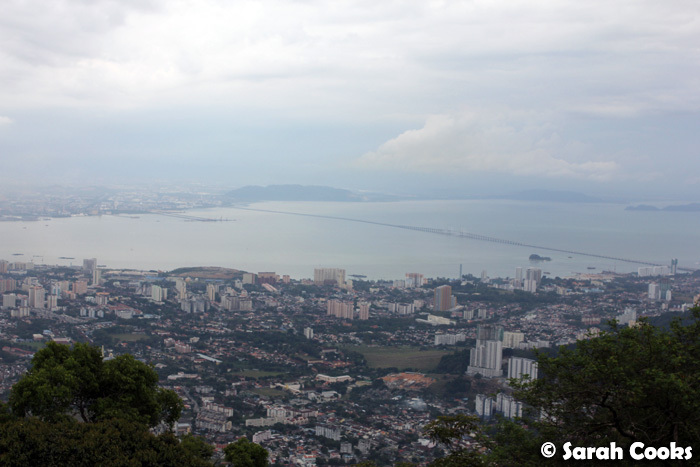 As I mentioned in my first Malaysia 2012 post, this was my first visit to Penang as a grown up, so I did a lot more touristy activities than I would normally. My particular interests (apart from food, of course!) were colonial architecture and history, and I tried to spend as much time as possible walking through Georgetown to see the old buildings. 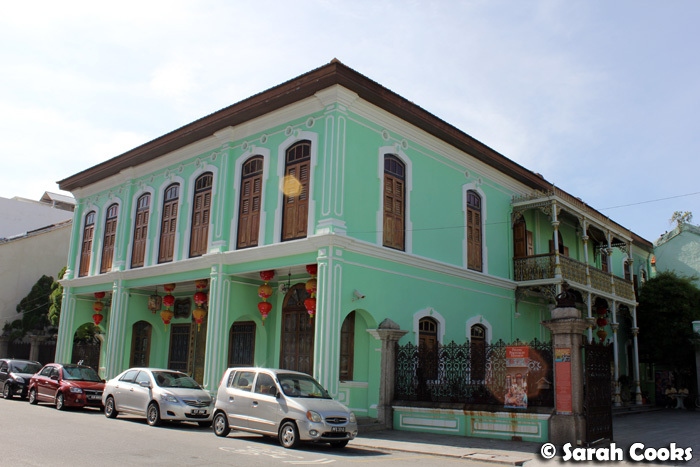 Growing up, I used to visit Penang almost every year, and the speed of progress and change really astounded me - I was so happy when I learned that Georgetown had been listed as a UNESCO world heritage site in 2008! I'm hopeful that this will mean better conservation than this below example. In 2001, an L-shaped skyscraper was built around one of the beautiful old mansions on Northam Road. Oh dear. 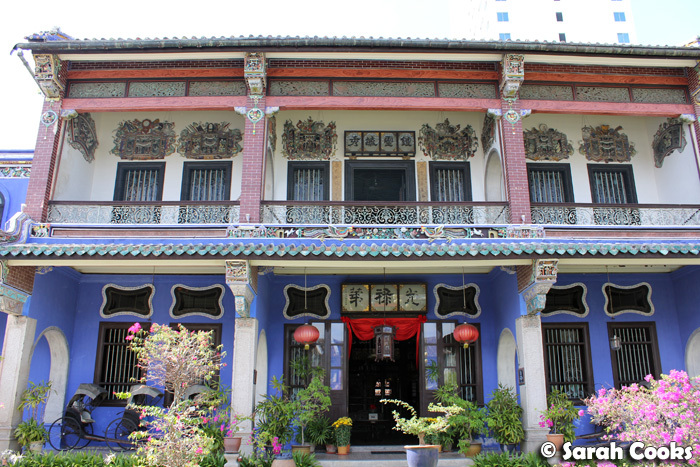 Today I'd like to share with you some of my favourite tourist spots in Penang. 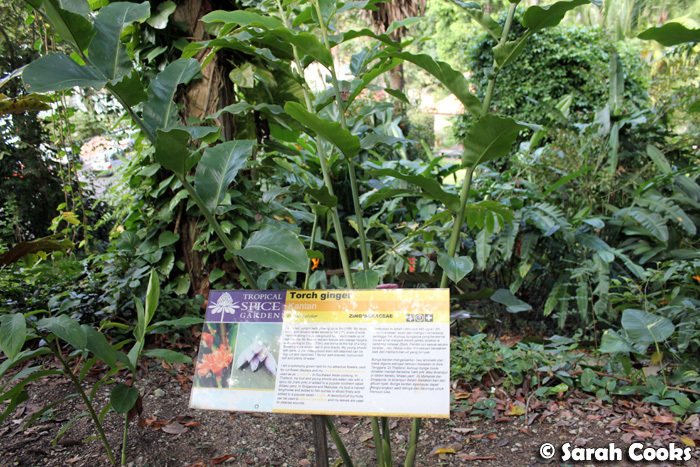 The Tropical Spice Garden covers eight acres of jungle, and houses over five hundred species of tropical flora and fauna. You can go on walks around the gardens and see all the different spice plants - this one below is torch ginger - and I've heard they also host cooking classes. 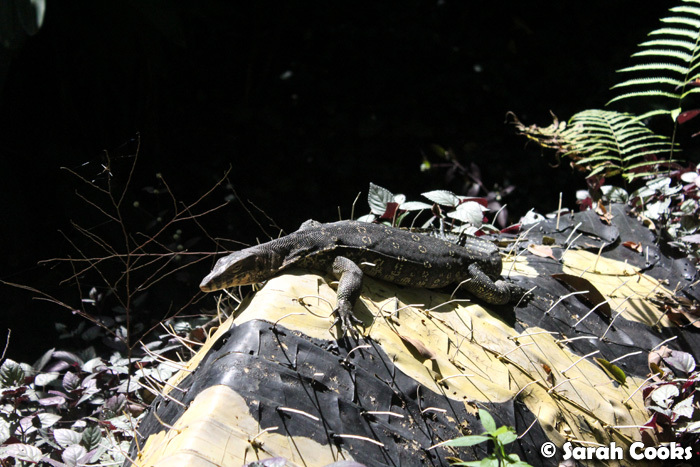 We even saw a big monitor lizard! Of course, being a true Malaysian, my favourite part of the visit was relaxing at the Tree Monkey Restaurant and having a refreshing drink. 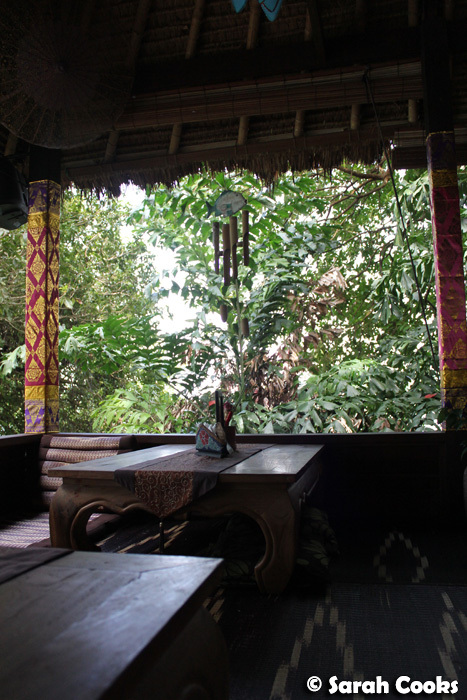 The restaurant, high up in the trees, serves Thai food and does snacks and drinks all day, as well as dinner at night. I didn't eat here, but my parents came here for dinner on their most recent trip to Malaysia, and greatly enjoyed the meal. 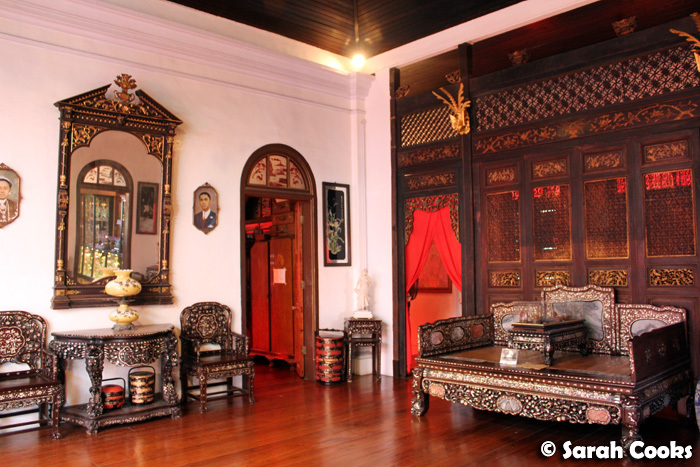 The Peranakan Mansion was my favourite destination of them all! On Church street is a big green mansion, lovingly restored to show the typical home of a rich Baba of a century ago. By the way: Peranakans are also known as Straits Chinese, or Nyonyas (females) and Babas (males), or simply Malaysian Chinese. My people. The interiors are absolutely stunning! The kitchen reminded me of the house my mum grew up in. 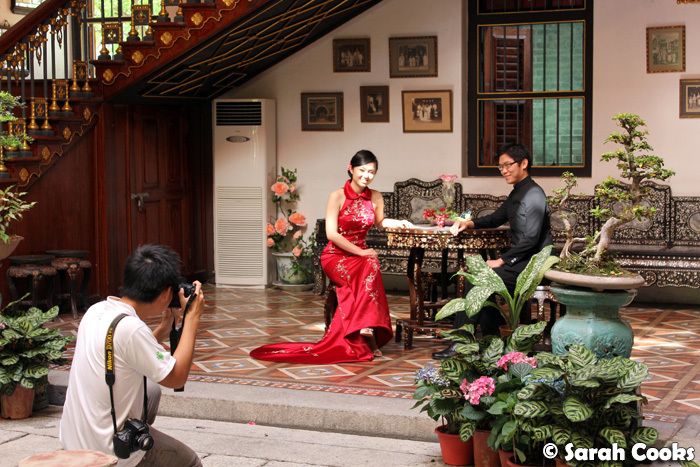 You can book functions in the mansion - we saw a couple having a photo shoot for a wedding while we were there. 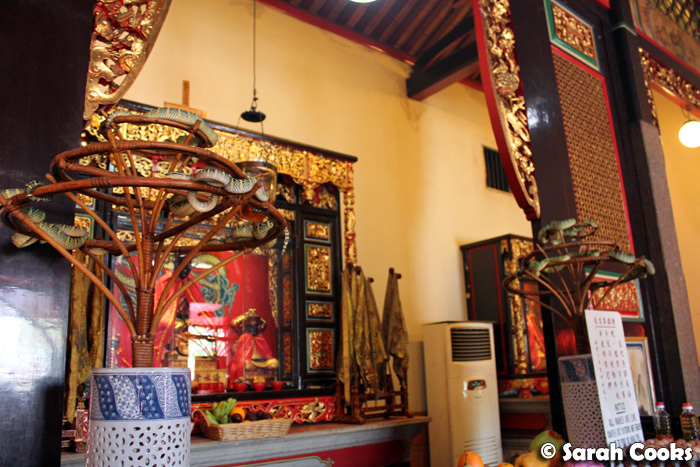 The Kuan Yin Temple, although listed as a tourist attraction on the Tourism Malaysia website, is one that I visit regularly to worship (kee pai). 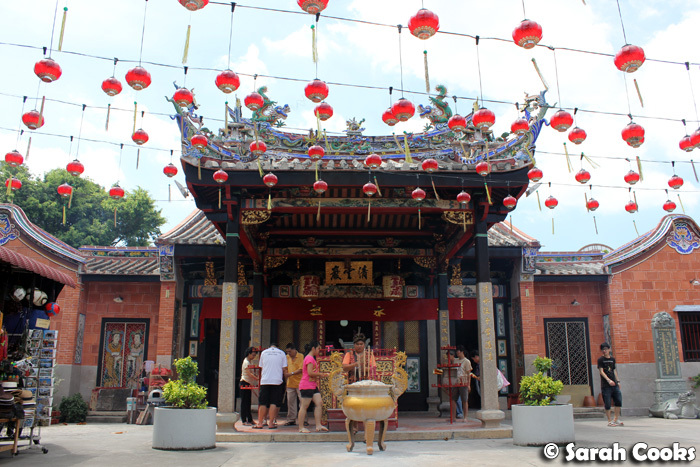 I think it's a great spot for visitors to Penang, as it really gives you a glimpse of the local lifestyle and traditions, without being as commercialised and touristy as, say, the Kek Lok Si temple. It's on Pitt Street, between Stewart Lane and Farquah Street. (I see very few tourists there, mainly fellow worshipers). 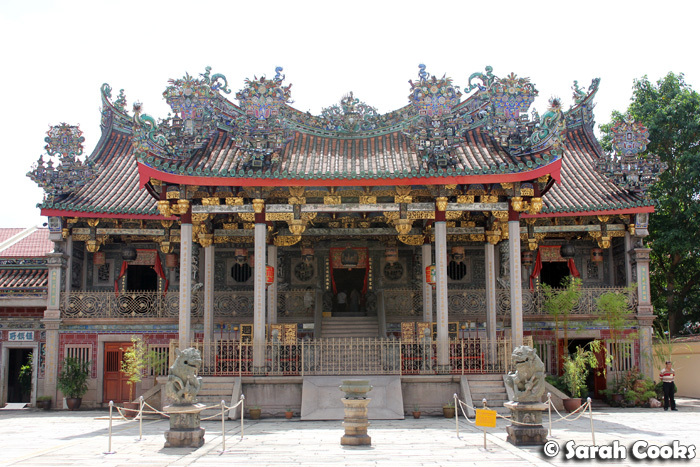 The Khoo Kongsi is the most distinctive and elaborate of the Chinese clan houses in Penang, and in addition to the clan house, the complex also includes sixty two units of shophouses and terrace houses, an opera stage and an office. The level of intricacy in the design is just stunning. 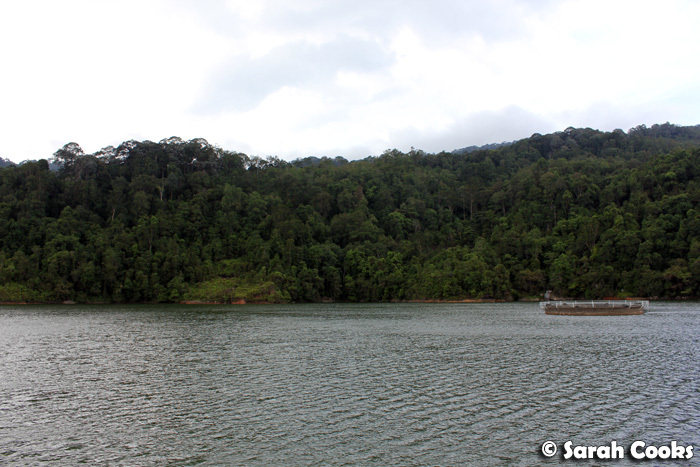 It's quite cool around the Ayer Itam Dam, providing a welcome respite from the heat. Many people come here to jog, and to enjoy the view of Georgetown. I'd never actually heard of the Ayer Itam Dam until my uncle brought us here, driving us up the windy road to the top - and I really enjoyed it! It was so beautiful, cool and peaceful. View of Georgetown from Ayer Itam Dam - you can see the pagoda of the Kek Lok Si temple from here! 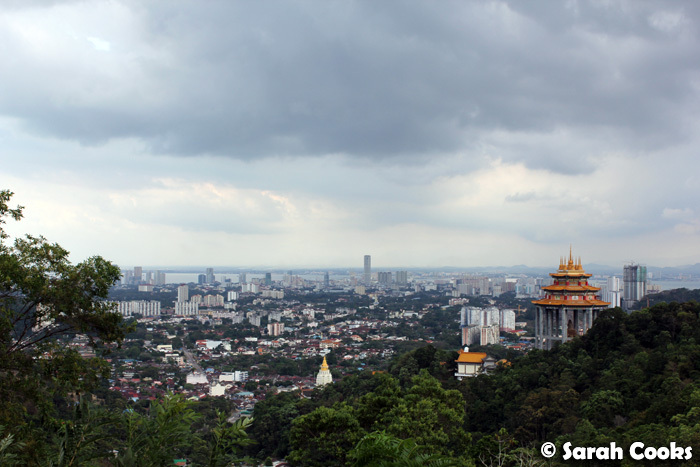 Penang Hill is a very popular site for tourists, with its panoramic views of Georgetown. A funicular train takes you to the top of the hill, where you can take tours of the hill, view the historical buildings, explore the forest, have a drink at one of the cafes, and more. 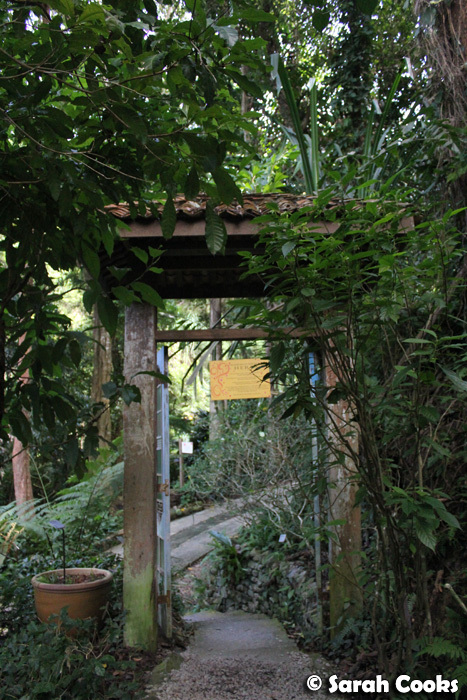 Penang Hill tends to be very crowded and touristy, and I much preferred the Ayer Itam Dam. 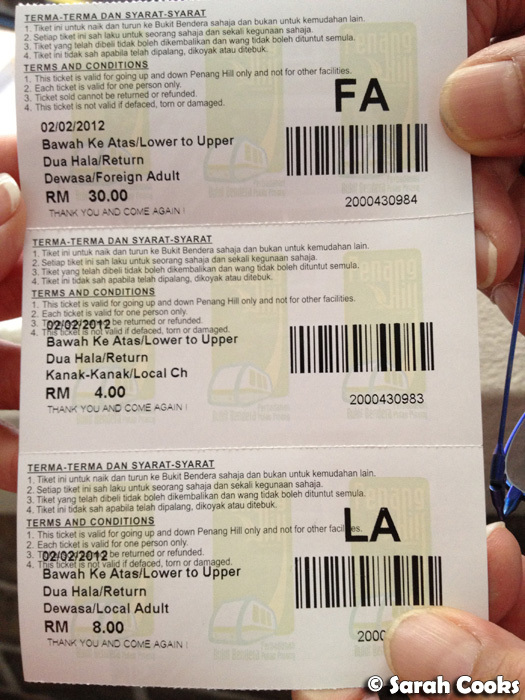 Another thing that puts me off Penang Hill is its horrible ticket pricing system - children or seniors are charged RM4.00, local adults are RM8.00, and foreigners are charged RM30.00. THIRTY! Aiyo, where got so unfair one, how can?!?! If you've got a Malaysian Identity Card (IC), make sure you bring it with you and remember to ask for local prices! 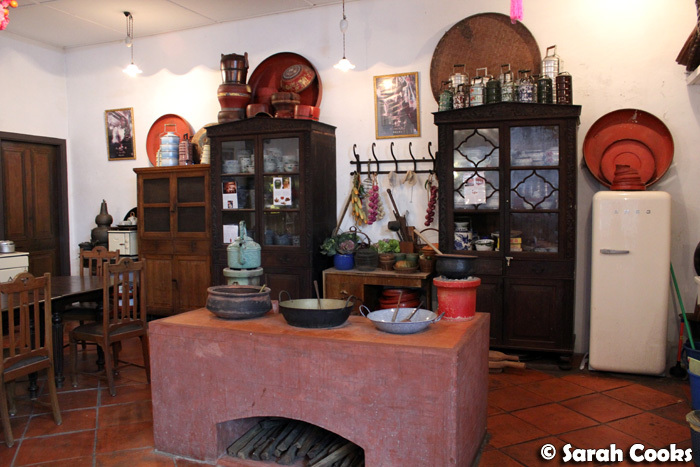 Not all places charge different prices for foreigners, but a lot do. 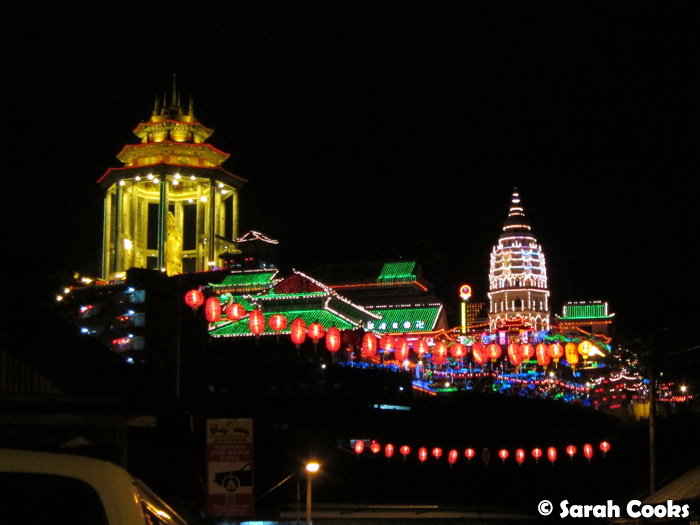 The famous Kek Lok Si temple, in the Ayer Itam area, is lit up at night during the Chinese New Year period. We didn't go walking around the temple itself, but did drive past at night to admire the view and snap some photos. I thought it looked fabulous, lighting up the night sky! Visitors are only permitted to visit the house on guided tours - there are three each day at 11am, 1:30pm and 3:00pm. Our tour guide was the very enthusiastic and knowledgeable Mr Poh, who explained the intriguing history, design and restoration process of the mansion - it was a great visit, and so fascinating! They Mansion also provides boutique B&B-style accommodation - there are sixteen rooms in the mansion, and I'm told that B&B guests are able to access the mansion at their leisure. 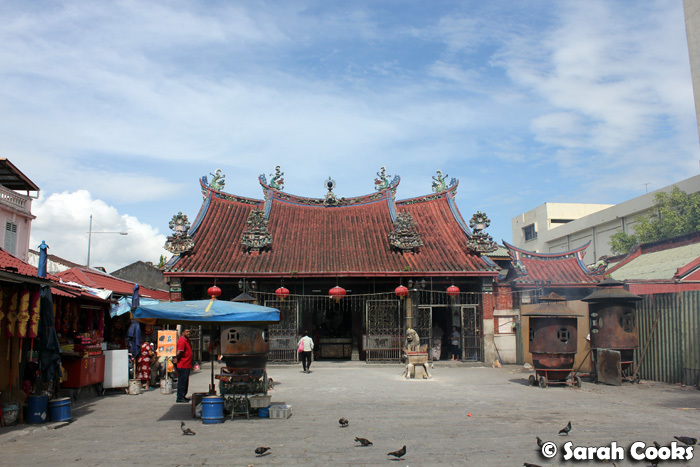 I'd never been to the Snake Temple, but have known about it all my life - an ordinary temple supposedly full of pit vipers. (Don't worry, these snakes are quite harmless as they're pretty drugged up from all the incense! And as a safety precaution they've been de-venomed.) It's quite far out of town, near the airport in Bayan Lepas, so my uncle took us here on the way to the airport. Because of all the hype, I must say I was a bit disappointed by the Snake Temple - I had expected a massive temple, with loads of snakes draped everywhere, but in reality it was a small temple, with just a few snakes coiled near the altars, as well as a few in the gardens. It was also highly commercialised, with lots of little souvenir shops. (Of course you can get a picture of yourself taken with a giant snake too, if that takes your fancy). Having said that, I'm glad we visited, so that I could finally see it for myself (and to enjoy a refreshing fresh coconut juice in the little stall next door!) Entry is free as well, so you won't lose out on much by visiting! 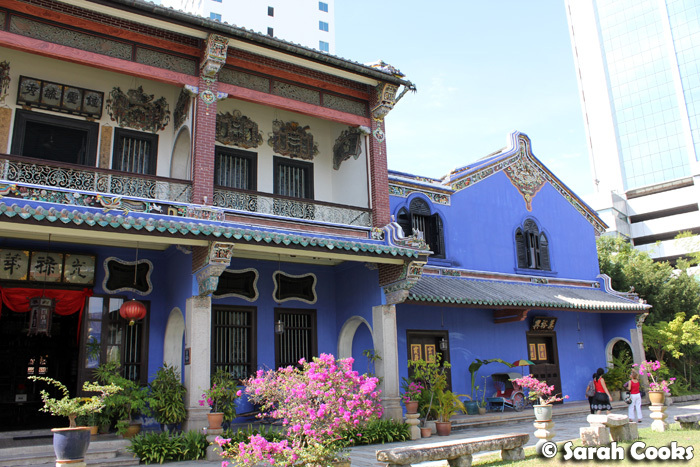 It looks like a lot of places to visit in just four days, but Penang is quite compact - with the luxury of having locals to drive us around, we actually visited the Peranakan Mansion, the Khoo Kongsi, the Kuan Yin Temple, the Ayer Itam dam, Penang Hill and the Kek Lok Si all in one day! (On the same day, we also managed to have breakfast at Fettes Park, visit a bunch of temples near the Khoo Kongsi, walk through Little India, have lunch at Tho Yeun and eat dinner at Goodall Cafe). PHEW! So, is there anything I've missed that you'd recommend seeing? 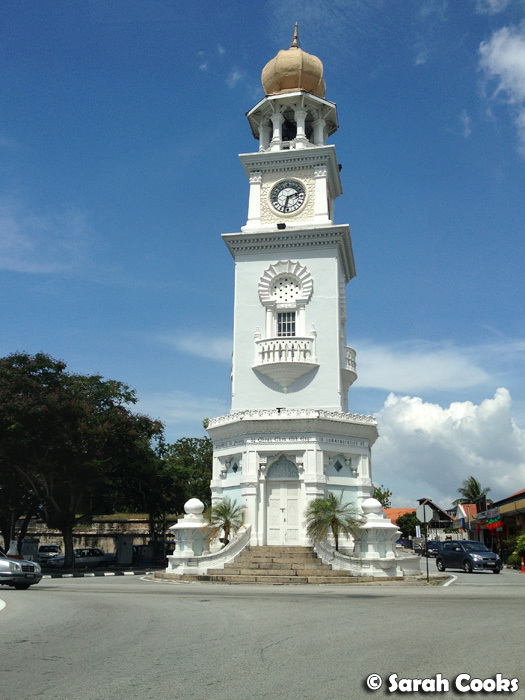 What are your favourite places to visit in Penang? 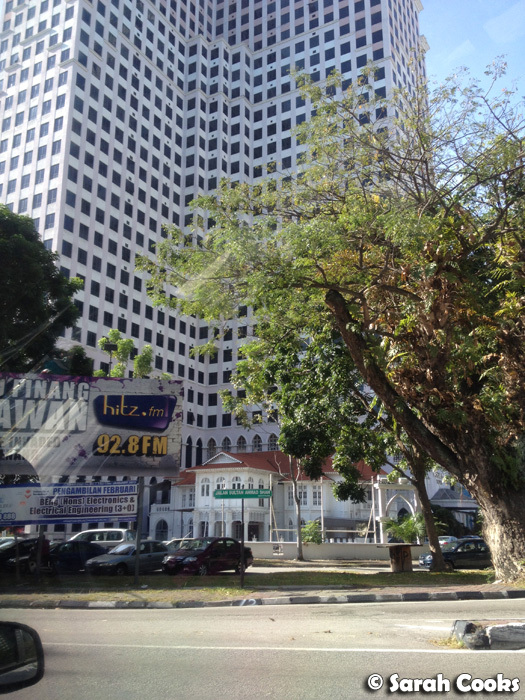 This is the fourth post in my series: 2012 Trip to Penang. Oh yes! And I forgot to mention it was also used in Indochine, the French film that won the academy award for best foreign film in 1992! 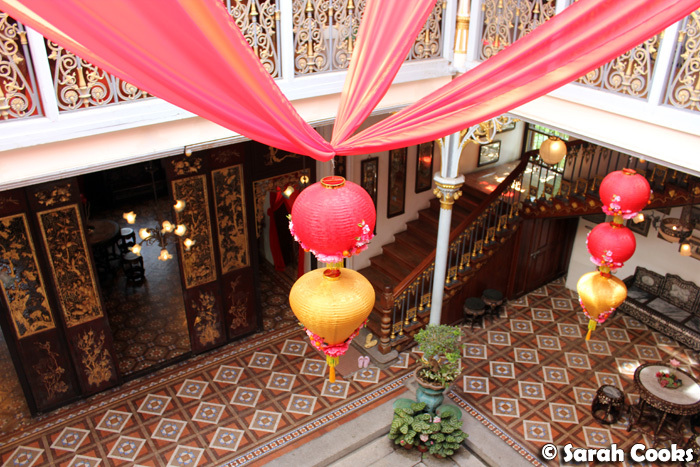 Peranakan Mansion was used thru a Singapore mandrian drama titled Nonya. 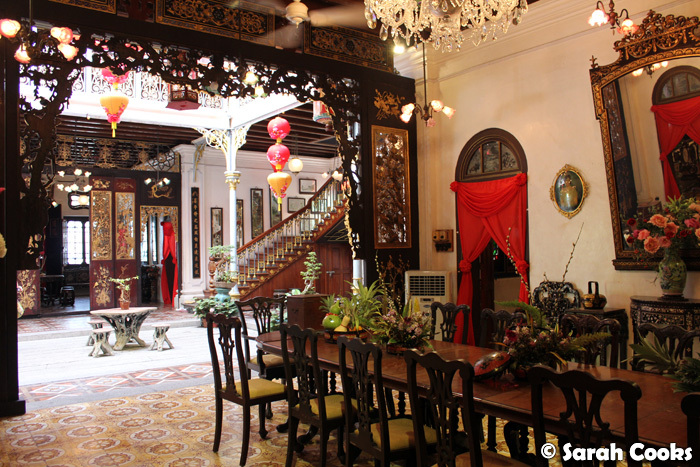 I learned quite a bit of Peranakan culture from the show. More trivia: my Dad once met Ursula Andress in the 60's or 70's when she was filming something in Penang!